Konza Technopolis Development Authority held a hackathon competition on Wednesday 5th, December, 2018 at Konza Technopolis City that brought a number of innovators from universities, colleges and the general public. In this event participants in groups of about 2-5 individuals, dived into an innovative way of problem solving. Two groups from Machakos University impressed the judges and won first and third prizes: The Kings Pyramid and the Electronic Voting system. 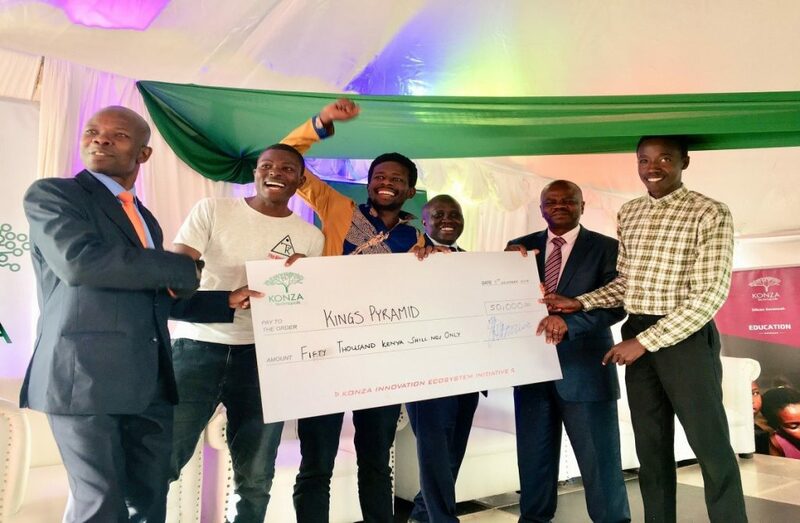 King’s Pyramid, developed by Mr. Victor Karume won the First Prize of Kshs.50, 000. It is 5-Mind Game collection concept aimed at aiding in brain development, multi-tasking & social skills as well as judgment and problem solving. Konza Technopolis Development Authority CEO, Eng. John Tanui presents a cheque of Kshs.20,000 being the 3rd Prize to the students who have come up with electronic voting system. “There are only two universities in Kenya, Machakos University and Others” Dr. Amukowa, told the audience.